And behold! There was light! A hair stylist is an artist, a personal consultant, a confidante. Leading hairdressers and key trend influencers know how to stand out, communicating their style, their brand, in a unique and unmistakable way. A salon is not just a work space…every element, every choice, down to the smallest details, reflects the hair stylist’s personality – from the location, to the furnishings, lighting and accessories. A Hair Stylist’s Salon needs to instil a sense of wellbeing and exclusivity, welcoming customers and putting them at ease before the start of a beauty ritual that will restore not only their look, but their self-confidence too. Light Design is fundamental in enhancing this experience. The design of hair salon furnishings must take into account various needs and, most importantly, it must make the most of natural light, creating a bright and attractive environment, even from the outside. Workstations must be well lit, with requirements varying depending on the tasks performed. The hair washing area calls for gentle lighting, to create a work environment that is pleasant for staff and comfortable for customers. In this case, spotlights aimed over the sinks may offer the perfect solution. Styling workstations can be enhanced with backlit mirrors equipped with front-mounted lights. MH mirrors from UNICA by Cantoni are perfect for this. Elegant and stylish, they are equipped with I-light technology that recreates the colour rendering and incidence of sunlight with absolute perfection. The opaline lenses are set directly into the reflective surface. The backlighting is flush mounted within the frame, radio frequency controlled and is spread at a radius of 180° from the profile of the anodized aluminium frame, which is mounted on a light, versatile, functional and stylish structure just 6.5 cm deep. For the Makeup Corner, UNICA by Cantoni offers complete, minimalist makeup consoles, a Made-in-Italy blend of aesthetics and function. They can be matched with wooden or satin-finished aluminium chairs, depending on the style of the Hair Salon. The salon’s lighting design can be completed with focal points and accent lighting, which can highlight furnishing items, accessories or products, using shelves with illuminated surfaces or raindrop lights. 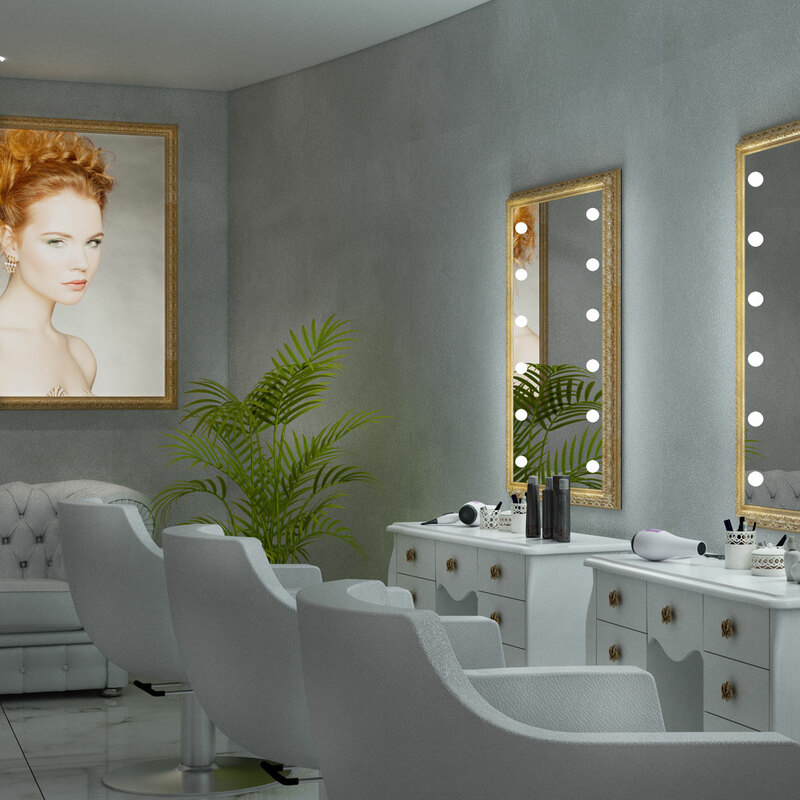 UNICA offers customised solutions and made-to-measure backlit mirrors for hair salons. Discover all of the furnishing solutions for hair stylists!